Can we get compatible magicolor 1690 single black? My Konica Magicolor 1690MF has' toner low YMC' on the printer display. Which toner needs replacement? Toner cartridges are typically given a letter which indicates which cartridge needs replacement as follows: K - black toner, C - cyan toner, M - magenta toner, Y - yellow toner. If your Magicolor 1690MF colour laser printer is reporting that YMC cartridges are low then this would mean that all of the three separate cyan, magenta and yellow colour toner cartridges need replacing. Each of the Magicolour 1690MF colour cartridges can be bought individually as a standard or high capacity cartridge from the list above, or we have packs of 3 colour Konica Magicolor 1690MF toner cartridges for each capacity which are more cost-effective. Can you tell me the name of the roller piece of equipment behind the image drum in the Magicolor 1690 MF printer and if it can be replaced? The number on it is "a0hfa732f0049339". Thank you. Unfortunately, we don't recognise the part number you've provided. Please refer to your Konica Minolta Magicolor 1690MF printer manual for help in identifying the parts you'll need to replace. It sounds like this part could be a transfer roller or fuser roller but we can't confirm this for you based on the information provided. We only stock the Magicolor 1690MF toner cartridges and image drum at this time so we're unable to supply you with the product you've enquired about in this instance. Do you give any warranty on the recycled Magicolor 1690MF cartridges and if they don't work can I send them back? We offer a 30 day money back guarantee on every item we sell. Providing that you order the correct items for your Magicolor 1690MF (UK model) printer and they do not work we can either refund or replace them. I have a Konica Minolta Magicolor 1690MF printer. The 'K' toner has run out. Is this the black one? Yes, the 'K' toner symbol represents the black cartridge in your Magicolor 1690MF printer. My Konica Minolta Magicolor 1690MF printer says 'Out of toner'. Do I need to replace the colour or black toner? Unfortunately, we're unable to advise which item needs replacing based on the message you're getting. The Magicolor 1690MF printer should be advising which cartridge needs replacing and this is usually done using a single letter to represent the colour: K is black, Y is yellow, M is magenta and C is cyan. For example, the printer may say "replace toner K" in which case you replace the black toner. If you cannot see any indication of which colour needs replacing, I would recommend checking your manual or contacting Konica Minolta directly. Is it possible to use the Magicolor 1690MF as a monochrome only printer? Also, how can I make it a double sided printer and how much does it cost to add this facility? The majority of printers do require all four cartridges to be installed in order to print. However, it may be possible to change the settings on your Konica Minolta 1690MF printer so that you can just install and print with the black toner. You would need to check your printer manual to see if this is possible. The Magicolor 1690MF does support duplex printing up to A4 size. If you require assistance with the functions of your printer we would recommend that you consult your printer manual of contact Konica Minolta for technical support. Konica Minolta has not generally been known for developing new printer technology, instead they are recognised for perfecting existing technology in very sleek, multi-function machines. This perception is shattered with their Magicolor 1690MF, a printer that takes a brand new look at how colour prints are made. While this printer does have some impressive specs and features, it takes a closer inspection to decide if it is really worth the price tag. 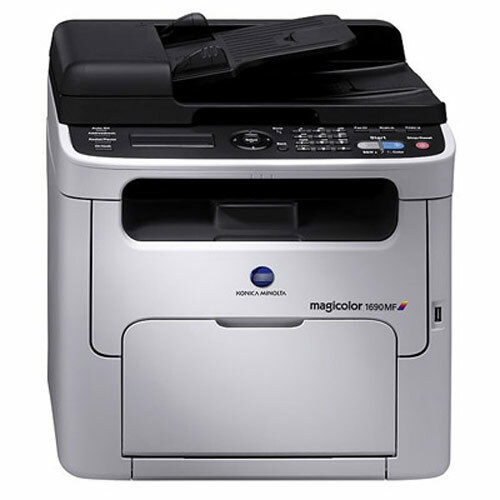 The simple appearance of the Magicolor 1690MF is deceiving for all the features that it possesses. In the base model, a small pull out drawer reveals the 100 sheet input while a side hatch gives access to the Konica Minolta 1690MF toner cartridges. The flatbed scanner, 50 sheet automatic document feeder, and basic LCD display is on the top. A simple pin pad and few basic buttons control the majority of the printer's functions which can also be accessed via the provided software. The back of the printer houses the 10/100BaseT Ethernet and USB sockets along with the power cord. There are a handful of expansions including a 500 sheet input tray upgrade and an automatic duplexing addition. Changing Konica Minolta 1690MF toner cartridges is easy and requires no extra technical knowledge, although the manual will take you through the entire process. Traditional colour printers have a 'single run' setup. This means that pages run through the drum a single time per print. The Magicolor 1690MF runs the sheets through a total of four times for every colour print. This makes for exceedingly slow speeds, 5 colour prints per minute, but amazing quality. Black text prints do come out at an impressive 20 sheets per minute as they only go through once. The other amazing aspect of this printer is the small foot print to the overwhelming amount of features include the automatic document feeder, scanner, built-in fax machine, and network compatibility. While the prints come out flawless, the scan feature of the 1690MF does leave some things to be desired. Scans may come out as grainy or streaky with complex graphics and colours. The only other major qualm would be the lack of features on the base model, which are more suited for a personal or home office than a small business.